Reliable industrial-grade 11 HP Honda engine with 2 year warranty with electric start. High-efficiency burner with transformer for years of reliable and affordable operation. Insulated Schedule 80 heating coil is made of 1/2 inch steel pipe and cold rolled. Comes standard with stainless steel coil wrap and 5-year warranty. Industrial-grade, tri-plunger, oil-bath, direct-drive, Kärcher pump with 7-year warranty. Safety relief valve attached to discharge side for protection against excess pressure build-up. Thermal pump saver valve protects against hot-water damage by venting recirculated water. 50 ft. of durable, wire braid high-pressure hose with hose guard for burst protection. Insulated trigger gun for hours of fatigue-free cleaning. Insulated, dual lance variable pressure wand with quick-couple connectors for easy attachment of high-pressure spray. 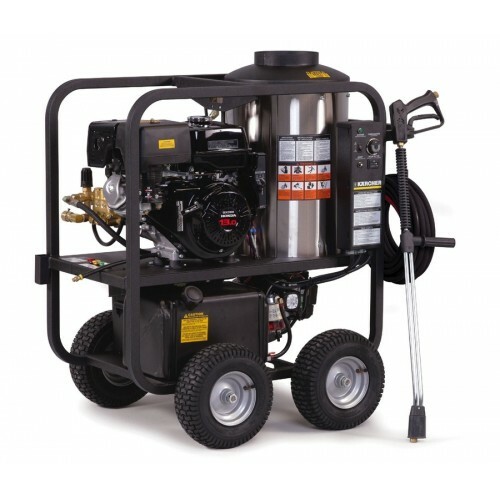 Includes four quick-couple spray nozzles for varying fan spray. Heavy-gauge 1 1/2" steel with powder coat finish for all-weather protection. Power platform cushioned on 4 vibration isolators for smoother operation and long-life protection to frame and components. 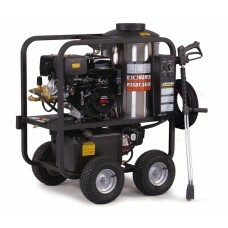 Rust-free 6-gallon polyethylene diesel fuel tank for hours of operation without interruption. Water resistant control box with burner on/off switch, adjustable thermostat and hour meter. 13" pneumatic tires for easy-handling on all terrains.